Camp 6, Guantanamo, where Haji Naseem was held for part of his captivity. U.S. government photo in public domain. Torture, secret confessions and recantations, an ominous email, a mysterious death, a detainee found hanging in a recreation yard outside his cell in the middle of the night — this is the story of the sixth man said to have died from suicide at Guantanamo. Up until now, his story has gone totally untold. Even the location of the camp inside Gitmo where he died was kept secret for years. What follows is an in-depth examination into what really happened. The narrative is largely based on an Army report that is mandated after a serious event like a detainee’s death. It is known as an AR 15-6 report. The article also draws upon declassified legal documents included in the detainee’s habeas filings. The full AR 15-6 report and Naseem’s Legal Response to the government in his habeas case are embedded at the end of this article. These and other relevant documents relating to this story are also available at GuantanamoTruth.com. Guantanamo detainee number ISN 10028, Haji Naseem (aka “Inayatullah”), resident of Cell E110 at Camp 6, was hearing “noises” in his head. It was his 18th month at the U.S. Navy-based prison in southeastern Cuba. Naseem had arrived at Guantanamo after three months imprisonment at Bagram Detention Center in Afghanistan. The date was a good one for propaganda purposes: September 11, 2007, the sixth anniversary of 9/11. By October he had been placed in one of Guantanamo’s more obscure settings, Camp Echo. The small complex of buildings was separate from the much larger Camp Delta, and held at most two dozen prisoners. It was known for harsh solitary confinement, and was said to consist of high-value prisoners headed for prosecution at the Bush Administration’s new Military Commissions. It may also have housed at one time a CIA black site. At the start, Guantanamo interrogators found their new prisoner “somewhat cooperative.” But within a few months, Naseem told interrogators that all the information he previously had provided had been a “lie.” Later, he would tell a psychiatrist provided by his defense attorney that he was coerced to cooperate with interrogators by threats to himself and his family, and because at Bagram he had been kept in a dark prison cell and subjected to sleep deprivation. 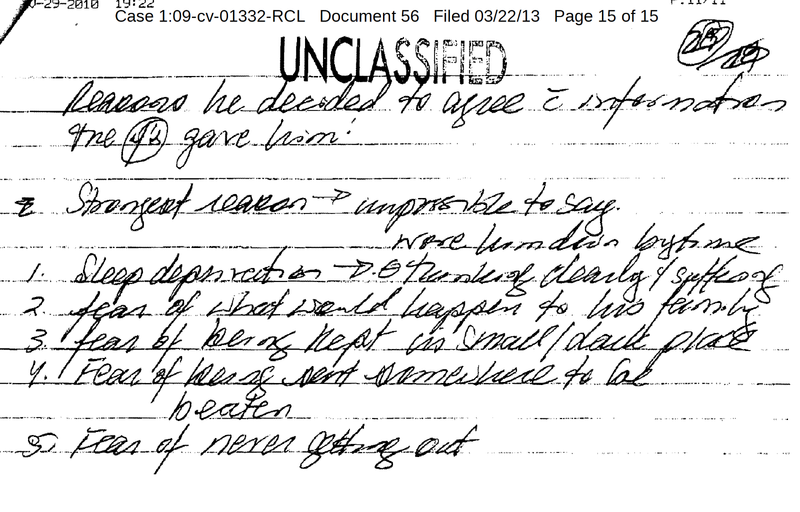 But an interrogation report on January 9, 2008 stated that a linguist told Naseem’s interrogator that the prisoner was mentally ill, or “could be getting depressed and incoherent.” Despite this, he was not seen again by mental health personnel for over a year, when on March 3, 2009, he told medical personnel he was hearing “noises” in his head. Naseem also told the doctors that he had a history of auditory hallucinations dating back to when he was 15 years old. He explained that as a result “he had been hospitalized and treated with medications,” according to a Summary of Behavioral Health Services Care written after Naseem died. The psychotic episode in March 2009 subsided after eight days. By March 11, Naseem said he was no longer having either hallucinations or suicidal thoughts. He did, however, tell his doctors that he believed “other detainees were accusing him of being a spy.” We shall see that this was not mere paranoia. In fact, Naseem was worried that tales of his cooperating with the Americans would get back to Afghanistan and bring retribution upon his brother, his wife, and his six children. U.S. interrogators had already played upon the prisoner’s fears that something bad could happen to his brother, Hidayatullah. In a very early interrogation at Guantanamo, on September 28, 2007, the interrogator told Naseem his “brother could get killed or arrested.” The U.S. government was accusing he and his brother of helping a local Al Qaeda figure. The interrogator told Naseem Al Qaeda “did not care about what happened to [his] brother.” He said Naseem shouldn’t worry about Hidayatullah but about himself. Naseem was very close with his brother. His father had died when both of them were young. Afterward, his mother had married his father’s brother. There were other children from this second marriage, and Hidayatullah was his only full sibling. There was more to worry about in his immediate situation. He was aware of “rumors” in the camp about his working with his captors. How could other detainees know about this? he asked his interrogators. The “Collector,” whose job was to analyze the events of that day’s interrogation, concluded Naseem had reason to be afraid, yet oddly at the same time saw the refusal as a ruse. At the same interrogation session, Naseem again recanted all his previous statements. The interrogators concluded, “The detainee is being influenced by other detainees.” Influenced how, they didn’t say. One thing the camp authorities did do for Naseem was get him out of Camp Echo. He was sent to the more communal prison site at Camp 6 and remained there until hospitalized after a self-harm attempt in March 2009. He would remain in Guantanamo’s psychiatric ward — the Behavioral Health Unit — for the next 19 months. Naseem was not the only detainee to have worries about being a government informant or otherwise providing information to interrogators. Other detainees are known to have cooperated with interrogators over the years, including Mohamadou Ould Slahi, author of the celebrated book, Guantanamo Diary. Like Slahi and Naseem, a number were tortured or threatened before they gave information. Al-Amri also expressed anxiety to his captors about other detainees thinking he was “helping the Americans,” as he was seen so often talking with interrogators. One detainee who took pains to hide his informant status was Harun al-Afghani, aka Haroon Gul (ISN 3148), who was held in Camp Echo at the same time as Naseem. Like Naseem, he was also brought to Guantanamo in 2007. Shortly after the FBI visit, Naseem was physically attacked by another detainee, Shawali Khan (ISN 899), in Camp Echo’s recreation yard. Khan reportedly accused him of being an “American spy.” Naseem said Khan attacked him while he was sitting down in the yard. The fight was apparently quickly broken up. According to Naseem, several detainees had told him in the recreation yard that they knew he was a “spy” as far back as Bagram, because they’d seen him at Bagram making phone calls. Only “American spies” were allowed to make phone calls home, the detainees believed. Naseem pressed his captors for “assurances” that he and his family would be safe if he were to continue to cooperate. For the Americans, however, Naseem’s cooperation always seemed dubious. They felt he was not providing the information they believed he really had. On March 21, Naseem’s interrogator observed in that day’s interrogation report that Naseem seemed “genuinely concerned of being perceived as a spy in the camp.” The interrogator noted he would speak to his team chief about the situation. It’s not known if he or she did, or what if anything happened as a result of that. Two weeks later, on March 26 , 2009— two weeks after he assured doctors he had no hallucinations or suicidal thoughts — Naseem attempted to cut his throat. Discovered in his cell, he had lacerations on both sides of his neck. Naseem denied harming himself, and attributed the wounds to an attack by Djinn, or “Central Asian ghosts,” as Guantanamo medical personnel described the term. Naseem survived, but spent the next year and a half in a cell in the BHU, Guantanamo’s psychiatric ward. Very little is known of this time spent in the BHU. But we do know that three weeks after he entered Guantanamo’s psychiatric ward, Naseem attempted suicide again by cutting both of his arms. He told doctors that Djinn were responsible for this attack, too. According to the BHU psychiatrist, writing retrospectively after Naseem’s death, the Afghan detainee never did rescind his belief in the attacks by the Djinn, and seemed “genuinely convinced” of their reality. A week or so after he cut his arms inside the Behavioral Health Unit, another detainee also held inside Guantanamo’s BHU, Mohammed al-Hanashi, was found dead in his cell, reportedly the victim of self-strangulation with the elastic from his underwear. There is much to contradict government accounts of his death. Additionally, it is possible that Naseem saw or knew more about al-Hanashi’s death. Authorities responded to finding al-Hanashi’s body by temporarily shutting down the Guantanamo computer system, the Detainee Information Management System, meant to document detainee activity inside the prison, an unprecedented event that precipitated an internal investigation by the Naval Criminal Investigative Service (NCIS). Later, all BHU computerized records for the days surrounding al-Hanashi’s death disappeared. Nineteen months is a long time to be held in a locked mental ward. After the slashing of his arms in the first month of his stay, most of Naseem’s actual progress in the BHU is not known. But a few facts have been reported. Naseem began taking 2mg of Risperdal (resperidone) on April 22, 2009, or almost a month after entering the psychiatric ward. Risperdal is a powerful and sedating antipsychotic drug. Given that Naseem had psychotic symptoms and suicidal behavior prior to the prescription of Risperdal, one wonders what drugs, if any, he was given prior that point. Nearly a year into his stay in the BHU, in February 2010 he complained of insomnia and was prescribed Ambien CR (continuous release). But records indicate he stopped less the sleeping pill after approximately a month. Later, he was caught hoarding medications, although it was unclear if this was for an overdose attempt, or because he just didn’t want to take the pills. His diagnosis by Guantanamo’s mental health unit was Psychotic Disorder NOS (not otherwise specified). In the Behavioral Health Services Summary written after his death, the BHS psychiatrist diagnosed Naseem as having Major Depressive Disorder, Severe with psychotic features. Naseem continued to take the antipsychotic drug Resperdal, 2mg each day, after he left the BHU. The dose was reduced to 1mg about three weeks after he returned to Camp Echo. When Naseem finally was released from the BHU in October 2010, it was back to the interrogations, the fear over exposure, the fears over his family’s safety, the fears of being beaten or sent back to a small, dark cell, like he was kept in at Bagram, where he did not see the sun for months. He felt embittered about broken “promises” made to him by U.S. interrogators at Bagram during his three month stay there. Despite certain “promises,” presumably of lighter treatment or even of release, after he “cooperated” with the Americans he was sent to Guantanamo. The Bagram interrogator had “lied” to him, and he was leery now about “promises” from interrogators. 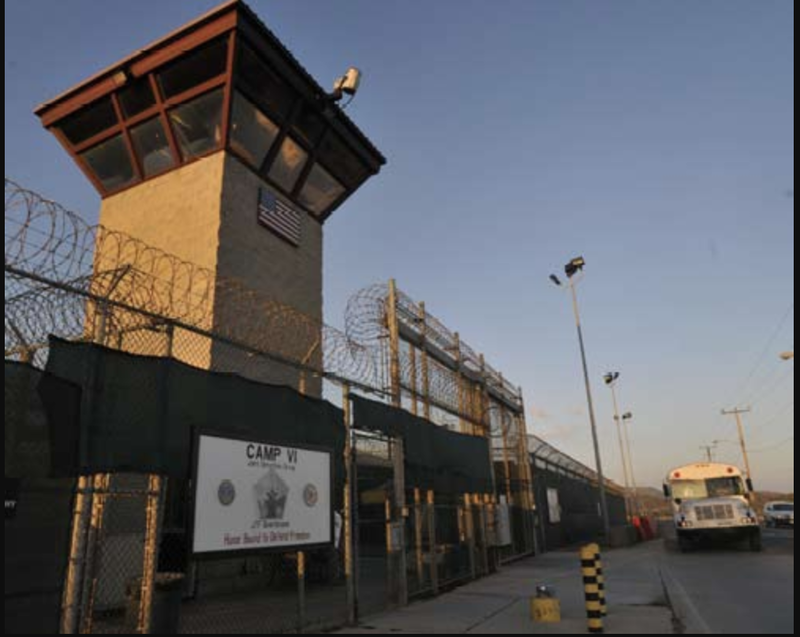 On April 29, 2011, guards noted in the record that Naseem was seen talking with Guantanamo’s HUMINT or Human Intelligence Collection Team, presumably interrogators. In early May 2011, he fired his military psychiatrist and asked to be moved to a more isolated environment in the camp, somewhere distant from other detainees. Previously, Naseem had been meeting with this psychiatrist, who was a woman, every two weeks after his release from the BHU unit. Behavioral Health Services personnel planned to meet with Naseem again on May 18. They wanted to see if he possibly changed his mind about foregoing visits with the psychiatrist. But the meeting never happened. Around 3:50 am, the morning of May 18, Naseem was discovered by guards hanging from by an improvised noose made of bedsheets from the top pole of the small recreation “pen” adjoining his cell. His feet were hanging above the ground. Recreation Yard at Guantanamo’s Camp Echo — U.S. government photo in public domain. Half an hour after the grisly discovery, and as guards still applied CPR to the dead or dying prisoner, an assistant officer-in-charge who came over from nearby Camp Five was perturbed. The call had gone out for an ambulance five times, and still no ambulance had arrived. Ultimately, Nassem was transferred to the Detainee Hospital, where he was pronounced dead. Did Naseem kill himself? Was he possibly killed by other detainees, who were angry about his cooperation with the Americans, or by perhaps by guards? Standard Operating Procedures for Camp Echo allowed for a very limited number of other detainees to be in the recreation yards at the same time. There was another detainee out in the recreation yard the night Naseem died, but he was supposedly in a yard in a different quadrant. 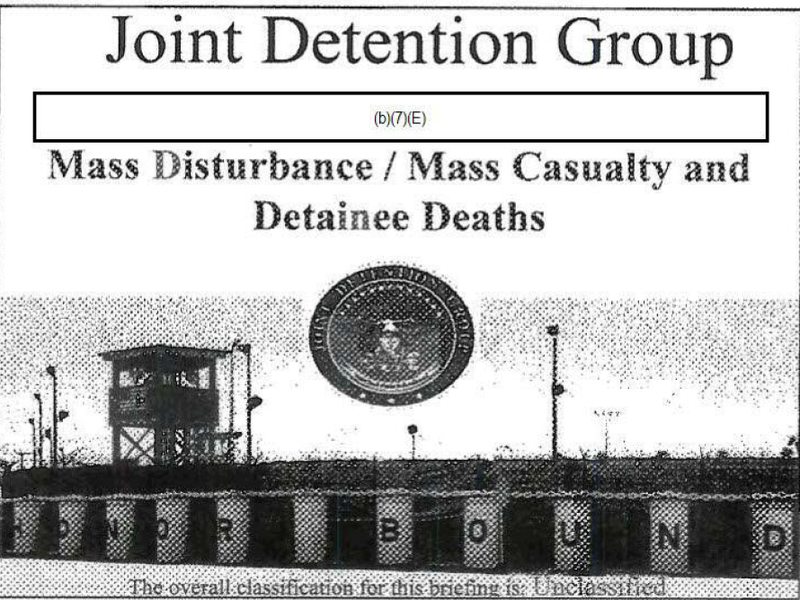 The records of what other detainees in Naseem’s quadrant were doing that night — part of the computerized Detainee Information Management System, or DIMS — were all redacted in the declassified release of the Army’s report. There was no mention in the report that any of Naseem’s experiences at Bagram or Guantanamo had anything to do with killing himself. 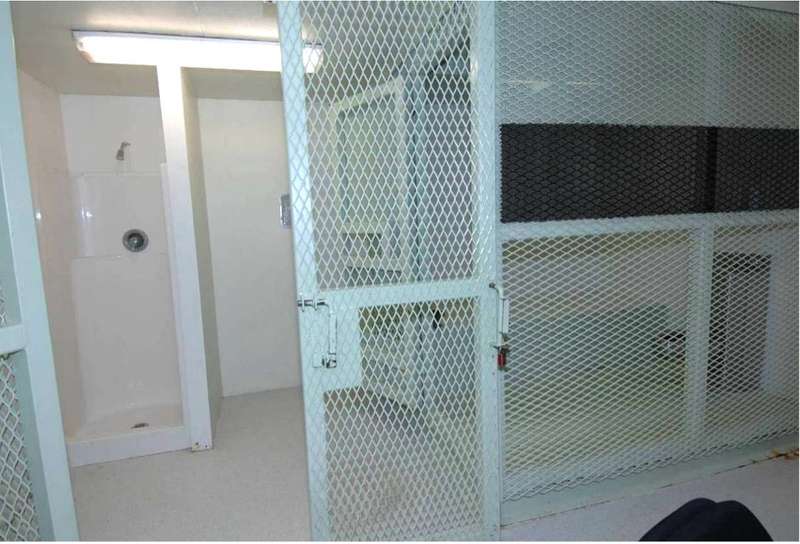 There was no allusion in the autopsy report, as there was in the case of the supposed suicide death of Mohamed Al-Hanashi, that harsh “conditions of confinement” were connected with Naseem’s psychotic wish to harm himself. “Applicable Standard Operating Procedures (SOP) and other pertinent JTF-GTMO orders in effect at that time were professionally followed…” the Army’s report said. The redaction likely refers to “line-of-sight” or direct, continuous eyeball observation. While much about the kinds of checks at Camp Echo at the time of Naseem’s death is redacted in the Army’s AR 15–6 report, it seems unlikely that anything unusual happened in relation to procedures inside Camp Echo on the day Naseem died. What was unusual were the procedures in Camp Echo, which were different than those of any other camp. While we can’t know for sure due to censorship what kind of checks guards were supposed to do on DOIs, we do know that at least two other detainees who died of supposed suicide at Guantanamo were DOIs, Abdul Rahman al Amri and Adnan Latif. According to Durand, DOIs were subject to “continuous checks” every 60 seconds. Interestingly, in what appears to be a slip up by government censors, who normally redacted any indication of how many Camp Echo detainees were DOIs, one official (not a regular guard) who worked at Camp Echo the night Naseem died indicated in his sworn statement that to his knowledge at Camp Echo “all of the detainees were detainees of interest” (see pg. 437, item 10 of the AR 15–6 report). The Joint Detention Group SOP states, “Any detainee who is considered at increased risk of suicide will be designated a DOI.” The Behavioral Science Consultation Team (BSCT), which usually included psychologists, were to make an Operational Threat Assessment on any DOI detainee, and determine risk of suicide. Detainees with a high risk level were assigned Acute Self Harm Procedures protection measures. Given that all detainees at Camp Echo were DOIs, it’s difficult to believe they were there for suicidality, or were even mainly high-risk. One wonders if some kind of experiment wasn’t happening at Camp Echo. Certainly it has been documented that experiments on prisoners did occur at Guantanamo. In his book Guantanamo: My Journey (unpublished in the United States), former detainee David Hicks, who like Naseem was imprisoned in Guantanamo’s Camp Echo, described how a guard would sit just outside a diamond wire partition next to his cell and watch him constantly, making notes all day long about what he was doing every fifteen minutes. This kind of direct behavioral monitoring is consistent with techniques used in observational study. Despite the fact some DOI’s were supposedly at risk of self-harm, the discipline in Camp Echo seemed much looser than in other camps. A different guard told investigators that guards were not responsible for determining how long a detainee spent in the recreation yards. Guards were also not responsible for inspecting the detainee’s cells, hence this guard could not answer a question regarding exactly how many bedsheets each prisoner had at Echo. “A lot of stuff that they have in Camp Echo is not in SOP” — Statement of anonymous camp personnel, dated 5/25/2011, pg. 390, AR 15–6 report. In another example of different procedures for detainees at Camp Echo, visits to doctors were not scheduled, as the doctors simply came to the detainee’s cell. One statement given to Army investigators from someone whose identity is redacted speaks to the special situation that appears to have existed in Camp Echo. “A lot of stuff that they have in Camp Echo is not in SOP,” this person stated, contradicting assertions made by camp senior leadership. The different level of security around Camp Echo detainees bothered the guards. According to the Assistant Officer in Charge at Camp Echo, guards complained to their superiors about detainees being able to use the recreation yards whenever they wanted, and about the difficulty maintaining visual contact on detainees when they did. Camp leadership allowed Camp Echo’s detainees “certain privileges,” and guards’ complaints “went unaccepted until this incident,” the Camp V Assistant Officer in Charge (AOIC) told Army investigators. “Many soldiers don’t want to work in Camp Echo because it has too many gray areas and information is not clearly articulated and posted,” the AOIC said. Though the many redactions make it difficult to fully understand the controversies over type and timing of detainee checks discussed in the AR 15–6 report, it appears that over time the continuous, “line-of-sight” kind of check that was required for Detainees of Interest morphed into irregular, periodic checks. Entry from March 6, 2011 “Camp Echo Westside/Backside Guard Pass On Log,” Exhibit 41 in AR 15–6 report. The final AR 15–6 report made it clear that a large and constant turn-over in guard force personnel at Camp Echo negatively impacted the situation at the detention site. Another possible complication may have flowed from the fact that in April 2011, daytime guard training at Camp Echo had been suspended, in order to shorten the amount of hours guards worked. The shifts were too long, and the shortening of hours was “for morale reasons,” the Chief of Operations for the 525th MP Battalion told Army investigators. There had been no training sessions in the month prior to Naseem’s death. But “when detainees are in the enclosed rec pen verbal feedback from the detainee is acceptable.” It is hard to imagine anywhere else in the high-surveillance, high-security environment of Guantanamo where a verbal assurance from a detainee was sufficient to offset a visual confirmation of their status. With all the emphasis in the government investigation about how guards’ surveillance failed in the small recreation yard where Naseem died, almost no notice is made of the fact that the detainee’s cell, and the areas outside his cell and leading to the recreation area were under constant video surveillance. IN fact, detainees had complained about how this constant surveillance made them feel like animals in a zoo. How could it be possible then that Naseem (or any other detainee) could take a bedsheet out of their cell and carry it to the recreation yard without being seen or noticed? Leaving aside other more sinister possibilities, one possible answer is that the Monitor, whose job it was to check the camera feed, was negligent in his or her job, or overwhelmed by the amount of camera surveillance, with probably dozens of screens, he or she was supposed to do. Indeed, one military observer implied that the Monitor job was perhaps overburdened. Other possible evidence appears unaddressed in the Army’s report. For instance, was there a forensic examination made of the bedsheet? We just don’t know. Aside from the autopsy and toxicology reports, Army investigation never mentions forensic evidence (unless it was mentioned in some redacted section of the report). The day before Naseem died, on May 17, the Deputy Commander of the Joint Detention Group (JDG), Guantanamo, was sensing something amiss. He thought there was “a lot of tension in the camps.” He sent an email to the J2, or intelligence chief, sending copies to “applicable staff and camp leadership,” according to a memorandum by the Army investigating officer, appended to the AR 15–6 report. Slide from Powerpoint presentation at Guantanamo training, an exhibit in the Army AR 15–6 release. In June 2006, three detainees had been found dead in their cells. The government said they had hanged themselves as an act of “asymmetrical warfare.” But their autopsies said they died of asphyxiation, not hanging. And a guard nearby later said he sawwhat looked like detainee movement the night they died, taking three prisoners to and from a secret CIA interrogation site at the base. When this author was investigating the suicides of two other detainees who died in 2007 and 2009, I was able to show that the government itself had discovered that the guards’ headcount, which placed the detainees in their beds just before they would have killed (or hang themselves), had been falsified. Strangely, it was also true that another email warning about a detainee’s possible suicide was sent to the guards’ commander the day that Adnan Latif, the last detainee to die of purported suicide at Guantanamo, was found dead in 2012. In any case, there was no follow-up regarding the Deputy JDG’s email warning in any of the documents released by the government thus far. The night Naseem was discovered hanging, Camp Echo’s Officer in Charge said he asked one of the “backside” guards responsible for watching Naseem what time the prisoner had asked to go to the recreation yard. In fact, as Army investigators discovered, it was Standard Operating Procedure to leave prisoner cell doors open when detainees went out to recreation. On the day he died, Naseem had spent hours in the Echo westside recreation pen — the camp’s computerized records showed he had gone to the rec yard around 8pm — mostly attending to a garden there, and had been able to freely walk back and forth from the “pen” to his cell. DIMS readout charting detainee’s actions, including by time, in the days leading up to his death. From AR 15–6 report, pg. 557. There is a lot that is mysterious about both the death of Haji Naseem and the detainee operations at Camp Echo. For instance, the timeline and circumstances surrounding the ambulance that took Naseem to the Detainee Hospital is heavily redacted. But the general outline of events seems pretty clear. The last known or admitted contact with Naseem was at 3:30am, when three “backside” guards saw Naseem at the entrance to the recreation area. The prisoner and the guards made eye contact with each other. Everything seemed “normal.” Naseem appeared to have been doing a lot of work in the small garden in the area that evening. It was not unusual for detainees to work outside in recreation yards at night, because it was cooler than during the hot Caribbean daytime hours. The guards discovered Naseem hanging from a bedsheet tied into a noose sometime between 3:45 and 3:50am. He was motionless, hanging from the top pole of the fencing in the small recreation yard not far from his cell. By their own testimony, no guard saw the detainee bring the sheet into the yard. The guards called for help. Naseem was hanging above the ground, possibly he had stepped off a small white plastic chair that was seen just below his feet. The guards had trouble finding scissors or shears to cut him down. More than one person tried to lift Naseem’s body up, the better to get at the noose and cut it off. Finally someone found some garden shears and they were able to cut him down. Medical personnel started to arrive about ten minutes after guards made the grisly discovery. 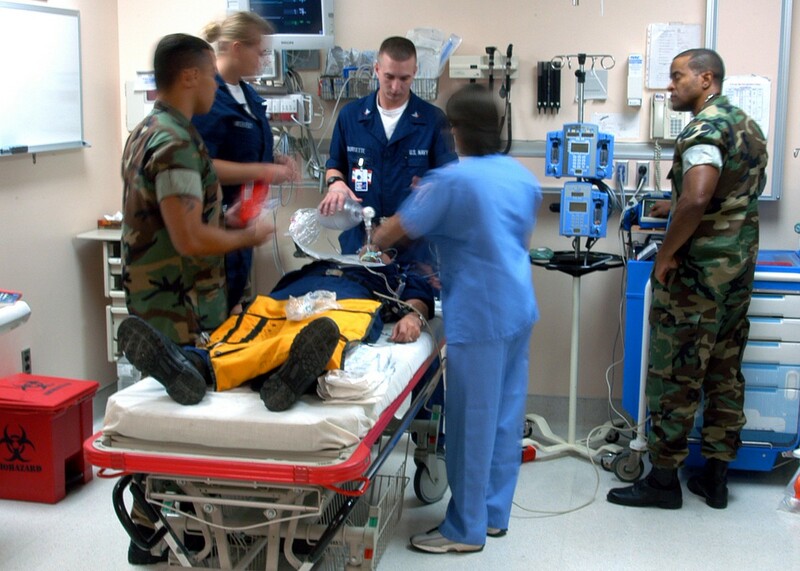 The guards began CPR, and could feel a femoral pulse. By 4:00, personnel on the scene felt no wrist pulse, and Naseem’s pupils seemed “fixed.” The detainee looked dead and was unresponsive. When later an automated external defibrillator (AED) was attached to his body, his heart did not have any rhythm (was “asystole”) that allowed for its use. The AED was prompted multiple times, but each time it showed no shock was required. Even so, the ambulance had to be called five times, and arrived a full 35 minutes after Naseem was discovered. It took about 10 minutes more to get him to the hospital, where fruitless attempts to revive him with IV and epinephrine ended with pronouncement of death by the Senior Medical Officer on scene at 4:53 am, approximately an hour after he was initially found by the guards. A chaplain arrived on the scene and tried to calm those present. He said a prayer. Guards were told to watch the other detainees via “line-of-sight” continuous surveillance during the emergency. One of the detainees requested to speak to an Arabic interpreter. Unfortunately, no testimony from this detainee or any of the other detainees at Camp Echo was included in documents released, assuming that it was even gathered by investigators. Currently, the Trump administration maintains that Guantanamo may still be used for new prisoners, even as 40 detainees remain there with no hope of release. Recently, the government opened a padded cell for Guantanamo detainees with severe psychiatric problems. It seems so easy for an individual to be lost in Guantanamo, forgotten and imprisoned for what seems like forever. That is why it’s important to remember that these people are individuals, with families, dreams, foibles and weaknesses. That they, like us, are all-too-human. So who really was Haji Naseem? The exact date of his capture is not known, but apparently was late May or early June 2007. He was an Afghan national, a Balochi by ethnicity, and a Sunni Muslim. For years, he ran a small dried fruit business near Quetta, Pakistan. Later he moved to a town in Iran, where he ran a grocery and mobile phone business .The government alleged some of the traffic in mobile phones was illegal. Naseem’s involvement with Al Qaeda supposedly began when he, and later his brother, were asked to temporarily house the wife and child of an Al Qaeda figure. Naseem refused to do this, though whether he ultimately was pressured to do so is not clear. In any case, if Naseem was no “terrorist” or “enemy combatant.” The evidence in government documents shows that he was at most a very reluctant participant in anything having to do with Al Qaeda. But if Inayatullah, aka Haji Naseem, confessed to some of these things as a result of coercive conditions amounting to torture after his capture at the American’s Bagram prison in Afghanistan, he recanted these confessions over and over again during his time at Guantanamo, even as early as December 2007. The released and declassified interrogation reports released by the Pentagon are not complete, but of the 45 available, as well as the 31 intelligence reports based on Naseem’s interrogations (all available at GuantanamoTruth.com), many, if not most, describe Naseem as uncooperative, or uncertain about cooperating. Close-up of section of Army’s AR 15-6 report on Naseem’s death, pg. 129 of PDF release — Yellow highlight in original. Other documents released by the government in Naseem’s case include instructions on how guards should handle detainees in straitjacket or “double litters” restraints. While it can’t be certain what constituted “level 4 restraint” at Guantanamo, it likely included restraint of arms, legs, torso, and head. While the government saw fit to highlight the issue of checking on prisoners in high-level restraints in the accompanying documentation to the AR 15–6 report, there is nothing in the redacted version of the report available that would explain why they included it, except this reference by Naseem himself about being “treated like a dog” by being put in heavy restraints. Whether or not one accepts the government’s narrative about who Naseem really was, it can’t be denied that he was one of the last detainees to arrive at Guantanamo, rendered from Bagram to the Cuba-based naval prison on September 11, 2007. Less than four years later he was dead. Indeed, at the time of his death his identity seemed swathed in mystery. He was one of a handful of Guantanamo detainees who were not included in the 2011 Wikileaks release of DoD assessment briefs of the hundreds of prisoners held by the U.S. Even the camp where he was found dead at was kept secret for years. Only after his death did his attorney, Paul Rashkind, a Federal public defender in Florida, tell the world his client’s real name: Haji Naseem. Indeed, these forms of torture were the reasons Naseem told a psychiatric examiner that he decided to provide information to the Americans. For their part, the intelligence agencies always felt Naseem was withholding information from them. But it may be that Naseem just didn’t know that much, as he either was not really involved in terrorist activities, or was such a small player that he really didn’t know much. A portion of “Unclassified Notes of Interview Conducted by Emily Keram, M.D. (11/10/10)”, published as an annex to Naseem’s attorney’s August 2012 response to the U.S. “factual return” in his habeas lawsuit. Department of Defense photo of Camp Echo cell, with attached personal shower [Public domain]. “Camp Echo consists of 10 wooden hut-like structures, with each detainee’s housing unit containing a sleeping cell and a personal living area. Detainees assigned to Camp Echo may recreate together up to 20 hours per day,” the report stated. According to a Guantanamo “primer” published by the Miami Herald, besides being used as a “as a meeting site between captives and their lawyers,” Camp Echo exists as a “segregation site for captives who can’t mix with others.” The Herald didn’t elaborate on that. “Doors to the sheds have reportedly been replaced with bars that allow in natural light, and detainees are reportedly allowed to move freely between the cell, shower area, and small interrogation room in each shed,” the report stated, based on a May 2008 interview with a DoD official. A Washington Post article in December 2004 stated that part of Camp Echo was used as a CIA interrogation site in the early years at Guantanamo. 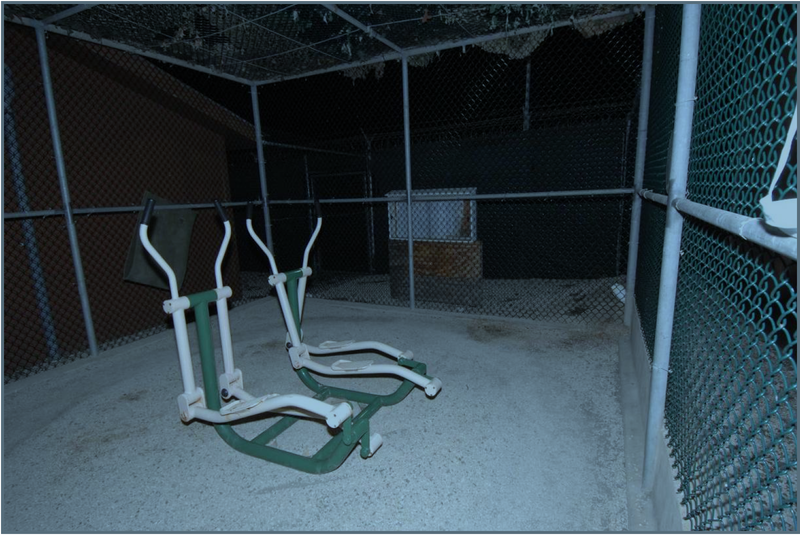 In subsequent years, it was used to hold detainees presumed to be tried by Guantanamo’s military commissions. A portion of the facility was also used for detainee-lawyer meeting rooms, and for meetings with the International Red Cross. 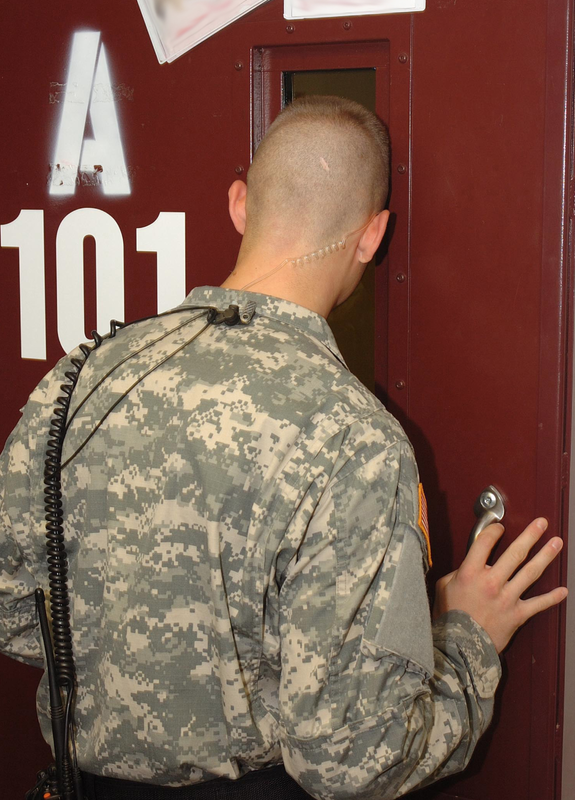 In 2013, a controversy arose when attorneys for military commissions defendants discovered that listening devices were being used in the rooms where they met with their detainee clients. Camp Echo was apparently riddled with surveillance devices, both audio and video. It is intriguing to wonder why Naseem was moved from one cell to another within Camp Echo eight times in the first two months he was there. It seems possible this frequent change of cell was meant to help disorient a prisoner, part of the process of “breaking down” detainees in their first months at Guantanamo. Prior to Naseem’s arrival at Guantanamo, JTF-GTMO authorities utilized something called the “frequent-flyer” program to move detainees around as a way to sleep deprive them. There was also a similar unofficial program. But whether either of these was active in 2007 is unknown. The period from December 2007 through May 2008 was unusually quiet, as Naseem stayed in the same cell throughout that period. 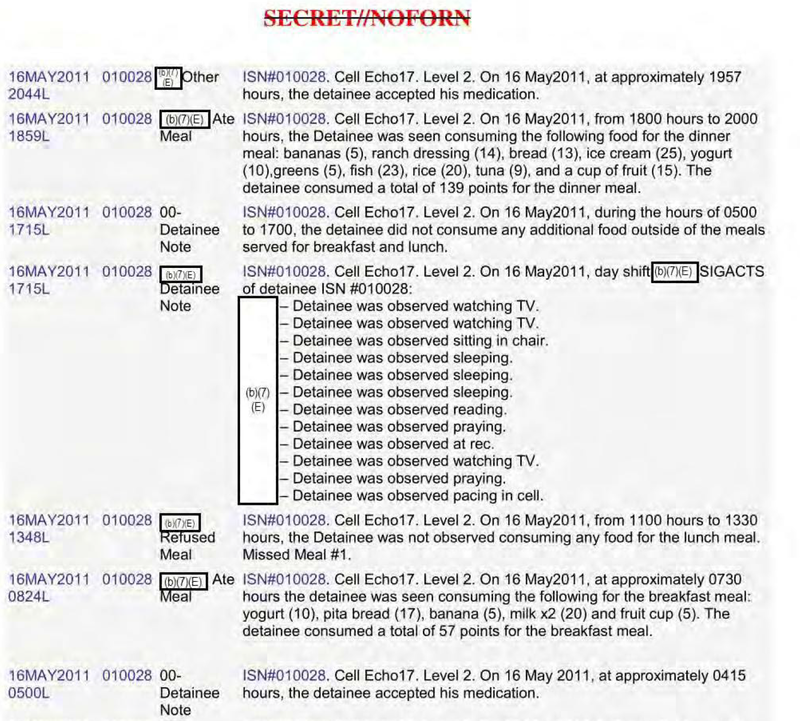 However, some of the interrogation notes from that same time show that Naseem was not necessarily cooperating with interrogators during at a good deal of that period. Hence, it seems unlikely that the cessation of cell movement was due to cooperation. It may have been due to his mental status. On June 3, 2008 Naseem was suddenly moved again. Then three days later he was transferred to Camp 6, a transfer that came after Naseem requested he be taken out of Camp Echo. He remained in Camp 6 until his hospitalization in March 2009. After he was released from the BHU on October 25, 2010, he was returned to Camp Echo, where was allowed to keep the same cell until the day he died. His last home at Guantanamo would be the morgue. This article originally appeared on Jeffrey Kaye’s Medium page.